I am a go player living in Somerville MA, where I somewhat regularly attend the Massachusetts Go Association. When I am not playing go I am an audio software engineer, pianist, and knight in training. I created this page because I was jealous that my friend NannyOgg had one, and I thought it would be a good way to get my studying in order. I was first introduced to go by my father when I was very young. He said, "If you put four stones like this it makes an eye. Eyes are good". I tried very hard to make an eye around the computer's single stones with no success. After trying for about 15 minutes I decided to give up go for life! Many years later in graduate school a friend left a goban in my office and left for Europe. I didn't know how to play, but when people would see the board in my office offering to play I decided to learn the rules, which they taught me incorrectly. I only played a small amount of go before having to give it up to work on my thesis. Fortunately, a month later I was stuck in an airport with a Barnes and Noble and bought The Book of Go by William S. Cobb. The book helped me out tremendously. The first time I had a seki we had to give up the game because neither of us agreed what should happen next. Once I knew the rules, however, I was hooked and the game became a lot of fun. At the same time my childhood friend David Grenier and I started to play a few games online. We now play weekly go games. I didn't start playing regularly until September 2004 when I accepted a position at Johns Hopkins University. At Hopkins there was a go club and the people there were warm and friendly. During that time I played go regularly and helped run the Hopkins Go Club. I love the club there with all my heart, but alas my sanity required a vacation, so I moved to Pittsburgh to stay with my parents. While living in Pittsburgh I attended the Pittsburgh Go Association. Unfortunately my time there was short, but I got some practice giving go lectures to kyu players and I learned a lot in the process. I'll miss you guys a lot! Since then I moved to Somerville, which is right near Boston. Truthfully I've been somewhat retired from go for a while. I'm trying to play piano and do well at the job, but feel free to drop me a line if you are ever in town and want to play a game! 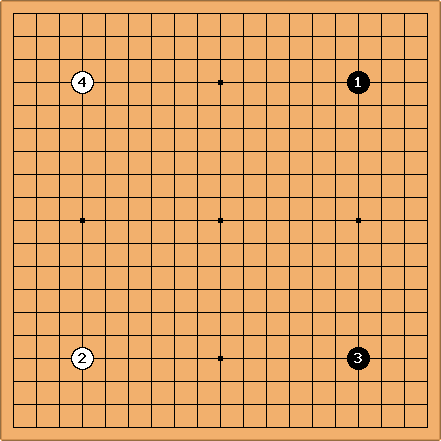 July 2004 - Learned the rules (correctly), watched Hikaru no Go. July 8, 2004 - Played first game on KGS against Dave. Sept 2004 - Joined Hopkins Go Club, made 18 kyu KGS. Feb 2, 2005 - Took first lesson with Battousai. Feb 27, 2005 First game against NannyOgg! So much fun! I appear to have been sandbagging (wasn't playing on KGS seriously yet). Sept 2005, I take my first lesson with Keith Arnold. Nov 2005, I meet Romanwahoo and GeorgeW at a Virginia Go Tournament. Roman plays the longest game ever and wins by a 0.5 due to a gigantic mistake I make in yose. I think at this point I'm 6 kyu AGA. May 20, 2006, May Maddness I went 3-1 at 3 kyu (I self promoted). The 3 wins were very solid wins, but the one loss was my first, first board match against Chuck Robbins. He totally fooled me! He gave me a prize to kill (a huge group), so I gave up a large amount of stones to kill an even larger amount of stones. He saved the group and got my stones. He will rue the day. Oh yes, he will rue it hard. May 28, 2006 Went 3-2 at the Maryland Open at 3k for 2nd place in the 3-4k division. Lost 2 games on the first day due to the usual suspects, but came back to beat the 1st and 3rd place players in the second day. I took Yuan Zhao's book on handicap go as a prize, but he left before I could get him to sign it. June 2006 I left Hopkins :(. August 2006 Went to go congress at literally the last minute. Met many online friends in real life and had a great time. Came in a 3k left as a 1k. It was totally worth it! October 28, 2006 Went 3-1 at the Pumpkin classic for 2nd place. Played almost all handicap games losing only to impulse (kgs 2k) giving two stones. Saw so many friends with over 50 people at the tournament! What a great time. Jan 2007 I moved to Mass. I love to fight! I'm terrible at end game so my game is 100% reliant on killing my opponent before endgame happens. When I first got into go I took some lessons with Battousai on KGS after seeing his classified post. He focused on opening concepts with me, which remains my favorite part of the game. I really enjoyed lessons, but at the time I decided to take a break from go and spend more time focusing on playing piano. I did focus on piano a bit, but my piano teacher accepted a job at a university in Texas. Without the looming obligations of a concert I was fortunate to meet a very strong local go player named Keith Arnold. Keith heard me play piano at a tournament and we worked out a deal to exchange piano lessons for his daughter for go lessons. Keith helped my game immensely mostly focusing on quelling my fancy and useless moves. I went over 5 stones studying with him! The best part of studying with Keith is his excellent sense of humor when dealing with my quirkiness. After moving from Baltimore I have more time to relax, play video games, and rethink my go. I decided to take one lesson with Alexandre Dinerchtein just to get a different perspective on my game and what my mistakes are. I hadn't any intention of taking another lesson, but the experience was such a delight I have kept taking them. Now that I'm "semi retired" from go I mostly just play drunken blitz and do problems when bored. Its fun! This book is what taught me go. To be 100% honest I like Janice Kim's book better, but its still really good. Excellent book, but was above me when I first read it. I find it a little hard to re-read after a certain point, but I highly recommend it to anyone interested. These helped my improvement the most at the time and I think they are an excellent resource for college/early adult beginners. This was a really fun book, which I read on the plane going to my sister's wedding in November. Unfortunately, I let my father borrow it and haven't seen it since. This is the best book for improving past the 12 kyu level. Its amazing. I skimmed over the invasion section (seems everyone does), so I am working on it now. ABCs of Attack And Defense by Michael Redmond. This book is not easy to get through because its incredibly dense. Its worth every penny, however, and even after reading a couple times, I plan on re-reading it. Get Strong at Life and Death by Richard Bozulich. I actually don't care much about this book. I think Life and Death seems better, but its a problem book, it can't hurt. I really like this book. I'm not all the way through it, but I reference it all the time. Its high on the tactics, but its very modern. This is a book by the great late Masao Kato. It is incredibly good, but very content dense. My game has got more focused after reading, and I'm much more confident in dealing with those annoying two space pincer josekis. Another book I am working through. Not far enough to comment, but it seems very good. A daily problem book, I really like it, but I'm putting it down until I get stronger. A very intellegent book, which I just started on. More later. Do "Get Strong at End Game"